Hello everyone, hope you all are doing good. Today I am reviewing one of the paraben free product which is Wow Skin Science Apple Cider Vinegar Foaming Facewash. Foaming face wash sounds interesting, right I also heard the first time and tried first time this kind of facewash. I even didn't try on my face any apple cider vinegar facewash. First time tried this product and excited to share it works for me or not. It has been enriched with pure Apple cider vinegar, Aloe vera extract, and Vitamin B5 &E for cleansing, healing, and hydrating care. When massaged on to damp skin, its rich foam dissolves and washes away dead skin cells, dirt, and pollutants from skin's surface and open pores. Apple cider vinegar helps balance skin oils, tighten open pores and lighten blemishes. Aloe vera extract soothes inflammation and gives intensive hydration. Vitamin B5 & E enhance skin's elasticity and ability to retain moisture. 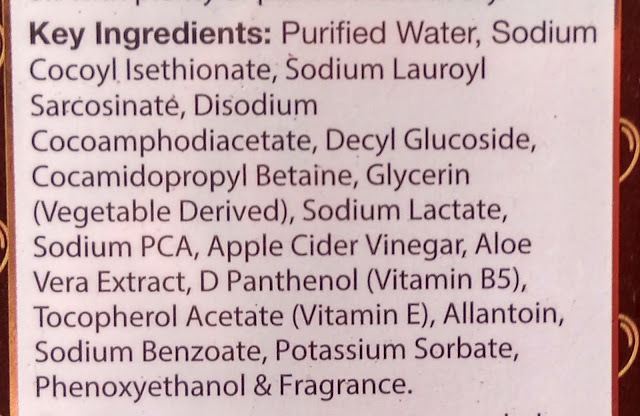 Wow Skin Science Apple Cider Vinegar Foaming Facewash comes with a dark brown cardboard packaging. The product name mentioned the front side of the packaging and all details are mentioned side part of the packaging. Inside of the cardboard packaging a huge pump dispenser with a plastic bottle. The product details also mentioned in the plastic bottle. As it's a foaming facewash so that it has huge dispenser so the product can easily out. I liked the packaging but it does not travel-friendly as its bulky kind of packaging. 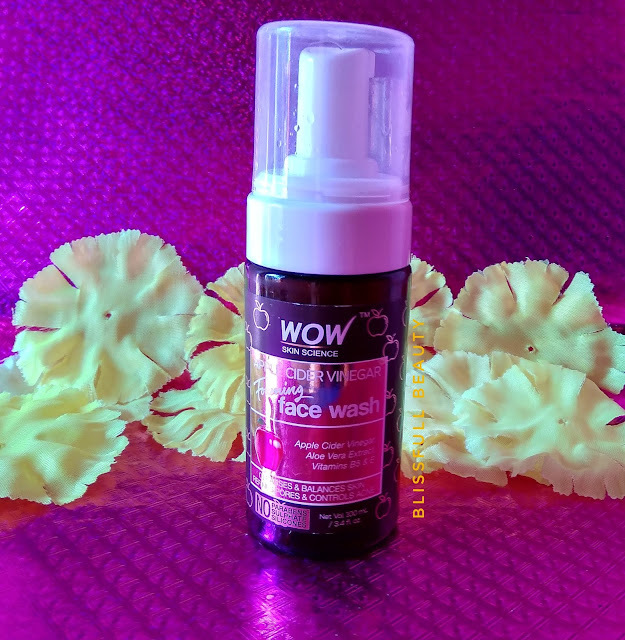 The color of Wow Skin Science Apple Cider Vinegar Foaming Facewash is white and consistency is in foaming form as it is a foaming face wash. The fragrance is exactly like Apple cider vinegar fragrance. Wet your face and neck. Pump a small amount of Wow skin science apple cider vinegar foaming facewash on to your palm. 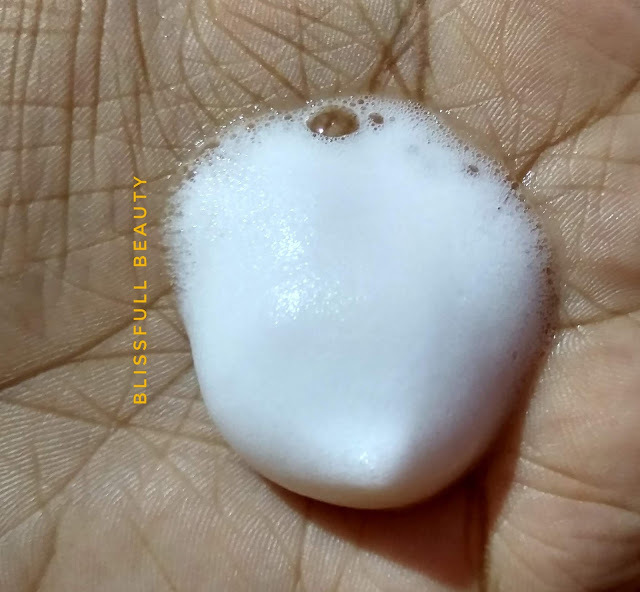 Gently massage this foamy cleanser on to damp skin with fingertips for 1-2 minutes. Wash off with plenty of plain water. Pat dry. ➡Not dry out the skin. ➡Controls oil from your face. ➡Not very effective on acne prone skin. 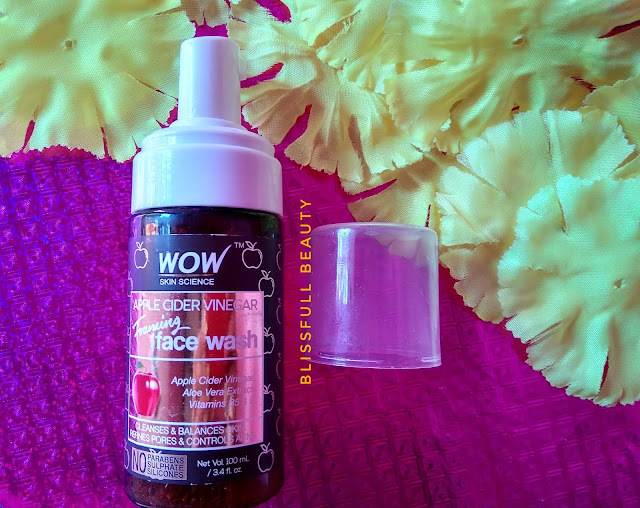 I already used this facewash about 2 to 3 weeks before and already finished half of the bottle.As I am the first time tried foaming facewash so very excited to know whether it works or not.Already mentioned it has paraben, sulfate free facewash which is very good.I am using morning and night twice a day. One pump is enough to wash your face. 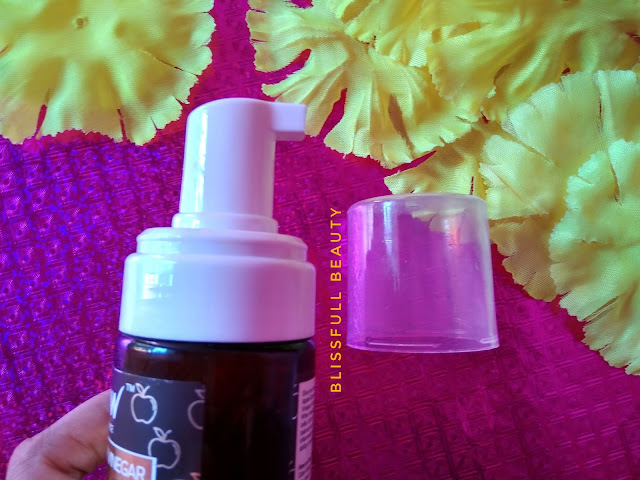 It cleanses well and controls the oil.If you have oily skin then you may like this facewash.I have combination skin and have not much pimple but it controls oil from face. But you can see the difference on pimple after using this continuously. When I am using for 3 to 4 days I can't see the difference but when I am using regularly for 3 weeks I can see a difference. 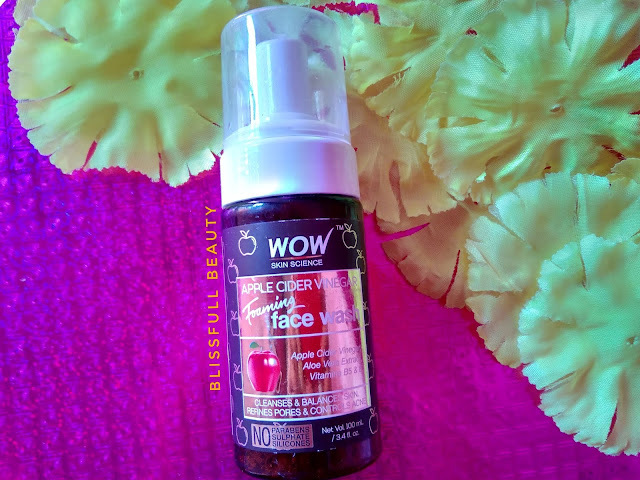 I can't say using this facewash your pimples are vanishes but as it contains apple cider vinegar so it works if you are using regularly if you want to see the difference. 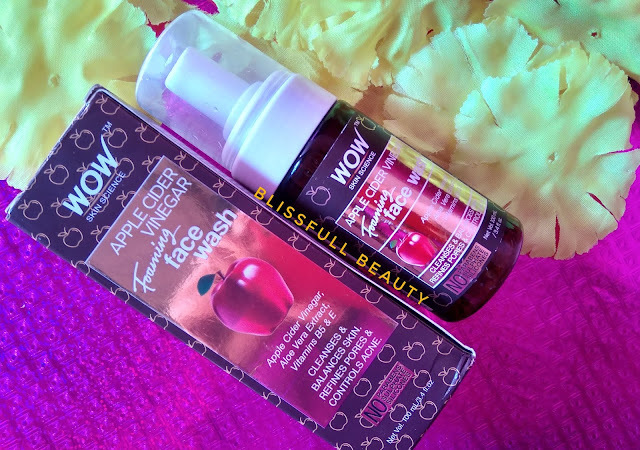 I am not very satisfied of this facewash but not bad as well. It is ok kind of Product for me.